With the launch of the Bellina, Wahl's favourite cordless clipper has had a makeover that gives the clipper twice the battery life and less than half the charging time. With classic styling and a long life lithium ion battery, you get all of the loved features in an updated clipper. With the introduction of lithium ion technology, you'll get 90 continuous minutes of run time but only need 60 minutes to reach full charge meaning you can work for longer. As an added bonus, the battery itself last twice as long as the older model, so you'll save on replacement battery packs over the life of the clipper. 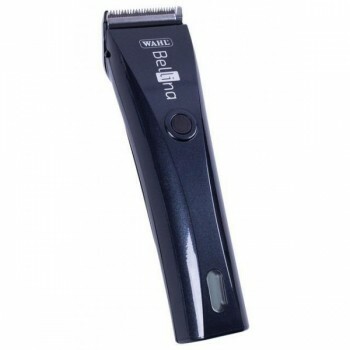 It's versatility allows you to clip, trim or shave and it has a quick-release snap-on blades (cutting width: 40 mm) with integrated taper (0.7–3.0 mm). The extremely quiet, DC motor gives you constant cutting power, regardless of hair texture and the LED charge indicator has an audible tone to indicate when charging begins and ends. The Wahl Bellina comes complete with its charging stand and transformer, blade guard, cleaning brush, oil and 6 attachment combs (#1–#4, #6, and #8).